Carton converter cuts costs by adopting straight-to-the-pallet banding system that requires no outer corrugated casing of the flats. “Packrite LLC, High Point, NC, is a converter/finisher for high-graphic corrugated packaging, folding cartons, and fluted blister cards. The company can customize its products and services to meet exacting user needs, including printing, laminating, die-cutting, folding, gluing, and building in carton window features for product visibility. Serving this diverse market requires meeting equally diverse and sometimes difficult design and construction challenges. On a business trip to Europe, Packrite owners Michael and Mary Drummond planned a visit to Bobst, a Swiss company well-known for its packaging and labeling equipment expertise. 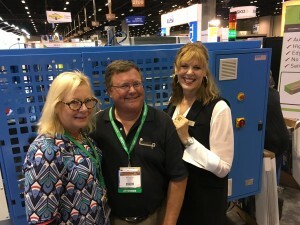 The Drummonds wanted to explore the latest gluing equipment innovations that could accommodate their company’s increasing need for versatility. During that trip, they serendipitously discovered something they hadn’t been looking for—the Model US-2000 Transit Line Ultrasonic banding system manufactured by ATS-Tanner Banding Systems of Switzerland, distributed in the U.S. by Wexler Packaging Products, Inc. Packrite purchased an ATS Automated Banding System and a Bobst Streampack batch collector and Bobst Masterfold 170 folder/gluer with double gyro box gluing feature as a package deal. Packrite had typically bundled carton flats in corrugated cases and then put the cases on pallets that were stretch-wrapped for shipment.  In December 2013, technicians from Bobst, along with Wexler technicians, installed the ATS Automated Banding System for zero damage bundling and integrated it with the Streampack batch collector and Masterfold folder/gluer, creating one fully automated turnkey solution. This new straight-to-the-pallet bundle banding system has allowed the company to eliminate the cost and time involved in corrugated casing/gluing operations and also reduced shipping costs per pallet.